“Game Over” – Drill’s mysterious end game is put into motion and the team must do their utmost to stop it before it reaches its final – and possibly deadly – conclusion, on the season finale of “The Whispers,” MONDAY, AUGUST 31 (10:01-11:00 p.m., ET) on the ABC Television Network. 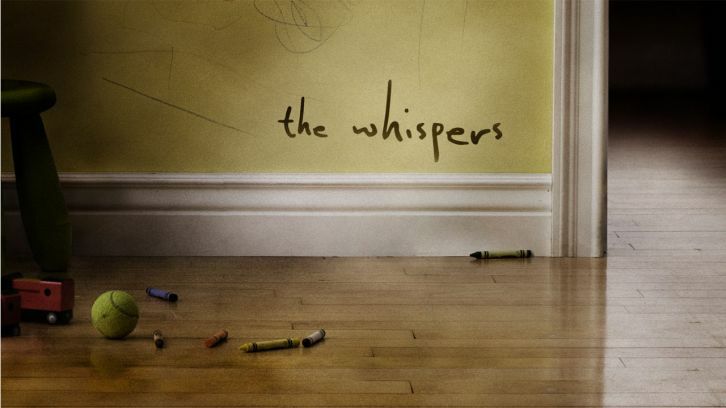 “The Whispers” stars Lily Rabe as Claire Bennigan, Barry Sloane as Wes Lawrence, Milo Ventimiglia as Sean Bennigan, Derek Webster as Jessup Rollins, Kristen Connolly as Lena Lawrence, Kylie Rogers as Minx Lawrence and Kyle Harrison Breitkopf as Henry Bennigan. Guest starring are Abby Ryder Fortson as Harper Weil, David Andrews as Secretary of Defense Frommer, Martin Cummins as President Winters, Kayden Magnuson as Cassandra Winters, Darien Provost as Nicholas Brewster, Michael St. John Smith as Air Force general, Crystal Balint as Tamara, Maeve Dudley as Jane, Ona Grauer as Jane’s mother/Meg, Peter Bryant as specialist, Nneka Croal as Minx’s friend, JC Williams as cop, Patrick Roccas as thin man, Moya O’Connell as thin woman, Elsa King as reporter 2, David Stuart as pundit, Michelle Martin as news reporter, John Billingsley as Ron Harcourt, Daryl King as FBI agent, Jennifer Lines as red haired woman and Lindsay Gibson as female friend. ”Game Over” was written by Zack Estrin & Ubah Mohamed and directed by Charles Beeson.